What it is: Samsung is trying to differentiate themselves while selling a commodity product. Samsung announced that they’re releasing Samsung Pay, a wireless mobile payment system similar to Apple Pay. The main difference is that Samsung Pay can also mimic a credit card swipe, which theoretically means merchants won’t need to upgrade their terminals to accept Samsung Pay. Of course, there’s a huge problem with Samsung Pay and it’s not called Apple Pay. It’s called Google Wallet. Like Apple Pay, Google Wallet lets you turn your smartphone into a digital credit card so you can pay for items without swiping an actual credit card. Google Wallet can work on all Android devices while Samsung Pay will only work on Samsung smartphones. The idea behind Samsung Pay is to keep customers loyal to Samsung smartphones. The problem is that Samsung smartphones are just another Android phone, so you might as well just use Google Wallet instead. If you rely on Samsung Pay, then you’ll be forced to buy and use Samsung phones so you can use Samsung Pay. Given the choice between Samsung Pay and Google Wallet, what are the advantages of Samsung Pay? The big problem with Samsung is that they’re trying to differentiate themselves from other Android manufacturers while using Android. That’s why Samsung created the Edge smartphone that displays information on the edge of a curved screen. If you like seeing information on the edge of a curved screen, you’ll have to keep buying Samsung phones. However because the curved screen isn’t a standard Android feature, you’ll have to rely on custom Samsung features that aren’t necessarily that useful. Samsung Pay is much like the curved screen displaying information along its edge. Interesting but not crucial. As a result, it’s still not a major reason why someone would want to use a Samsung phone. The big problem with Samsung Pay isn’t that it basically duplicates Google Wallet or that it mimics Apple Pay but that it tries to give Samsung a unique feature to lock customers into Samsung phones. Yet because Samsung relies on Android, they can’t differentiate themselves too much or else they won’t be compatible with Android apps in much the same way that the Amazon Kindle tablet isn’t able to run any apps but special Amazon apps designed for the Kindle. Samsung is basically stuck with a commodity operating system (Android) that they’re trying to turn into a unique product like the iPhone. Despite Samsung’s heavy marketing budget, they can’t hide the fact that they’re just another Android manufacturer. Samsung phones may be different than other Android smartphones, but they’re no different than an iPhone and no cheaper either. Samsung isn’t competing against Apple so much as they’re competing against other Android manufacturers like Xiaomi. While Xiaomi eats away at the low-end smartphone market and Apple continues grabbing the high-end smartphone market, Samsung is left with nothing but gimmicks like the Edge (curved screens) or Samsung Pay (a Google Wallet alternative) to make their products unique but still the same. As Samsung’s falling smartphone profits signal, this strategy doesn’t work. If Samsung wants to be unique, they need to offer a one of a kind product, which is the purpose of Tizen. Unfortunately to gain support, Tizen must be open source, which means Tizen is just another commodity product like Android. The only difference is that Tizen app sales will benefit Samsung, so few of their competitors will want to support Tizen. Because few competitors will support Tizen, that means less support for Tizen. Can you see the vicious cycle that Samsung has put themselves in? By trying to copy Apple with a commodity product, Samsung is trying to do the impossible, which is to be unique and the same simultaneously. Watch Samsung’s smartphone profits continue to fall and watch Samsung get more creative in coming up with more gimmicks to keep themselves in the spotlight while wasting millions in advertising to convince people that their trivial differences are worthwhile features. It’s an exercise in frustration so don’t expect this to end well for Samsung. What it is: IBM defined the PC standard and for years relied on their own ThinkPad laptops for their employees. Now that IBM is no longer in the PC business, they’re planning to switch from Lenovo ThinkPads to Apple MacBooks. At one time, IBM represented the corporate drone mentality that Apple rallied against. IBM typically represented the faceless, mindless corporate masses working like robots in a factory with no creativity of their own. Perhaps one time that was true, but after IBM bowed out of the PC market and sold their PC division to Lenovo, they clung to ThinkPads for the longest time. Now IBM is planning to offer their employees MacBook laptops as an alternative to Lenovo ThinkPads. Why would IBM do this? First, the world is no longer solely a Windows PC world any more. In the old days, it only made sense to buy a Windows PC since that was the only computer that offered the most hardware and software support. Nowadays with the Macintosh software market growing and the steady shift to browser-based applications, the specific operating system you use isn’t as important any more. Even more importantly, any Macintosh can run Windows through a virtual machine program like the free VirtualBox or the commercial Parallels or Fusion programs. With a Macintosh, you can run Windows as a virtual machine, but with a Windows PC, you can’t (legally) run OS X as a virtual machine. Thus a Macintosh gives you two computers in one (a OS C Macintosh and a Windows PC virtual machine). Right away the Macintosh has advantages that a Windows PC can’t match. A second, less technical reason, is that many people want a Macintosh. Typically people tolerate a Windows PC because it’s what they use at work, but they prefer a Macintosh at home because it requires less maintenance. When given a choice, some people will opt for a Macintosh and some will choose Linux while others will prefer a Windows PC. It’s no longer the case that everyone needs a Windows PC. Even back in the days when everyone did need a Windows PC, not everyone liked using a Windows PC. They did it because they had no choices. Now with so many people relying on smartphones, tablets, and alternative PC operating systems like OS X and Linux, there’s less of a need to use Windows. Windows thrived when people had no choices. OS X and Linux are thriving because people have choices. When you give people choices, not everyone will choose Windows, and that means a steady decline in the importance and influence of Windows in the overall computer market. IBM already sees the future and it’s not in PCs and not in Windows. Now that IBM has openly embraced the Macintosh, it opens the doors for other major corporations to abandon their Windows-only mentality and allow more of a mix of computers based on what employees want, not what their IT department demands. The IT department should never choose the tools workers use. The IT department should always support whatever tools workers choose for themselves. The workers know what’s best for their productivity. The IT department only wants to standardize on certain equipment to make their own lives easier, which is like a waiter serving you whatever food he or she feels like giving you just because it’s convenient for the waiter, regardless of your own wishes. If you wouldn’t tolerate someone making choices for you for their convenience and not yours in a restaurant, why would you tolerate that at work? When Windows can thrive only when people have no choices, that doesn’t speak well of the product’s quality or desirability. Lack of choices is what makes dictatorships appear to work. IBM’s switch to the Macintosh is only the beginning. As more companies realize they have choices, they’ll be less likely to choose one particular operating system all the time. That’s good news for the Macintosh, but bad news for Windows. However, it’s good news for consumers and workers alike because it’s always better to make your own choices than letting someone else make them for you. Read more about IBM’s decision to buy Macintosh laptops for their workers. What it is: The Apple Watch defines the new market for wearable computers with one particular emphasis on health and fitness. The first step to recovery from any addiction is to first acknowledge the problem. The second step is to measure your activity so you know what you need to change and what may or may not be working for you. When people try to lose weight, they count calories. When people try to break an addiction, they monitor how many times they stray back to their addiction. By monitoring your behavior, you can clearly see whether you’re getting closer or further away from your goal. That’s what makes wearable computers such as the Apple Watch so compelling. With the Apple Watch, it’s constantly monitoring your activity from standing every hour to how many calories you’re burning during the day. Without the Apple Watch, it’s impossible to know for sure how much activity you’ve done or where you might be from your goals. With an Apple Watch, you’re constantly able to see what you’ve done every minute of the day. Not only does this give you a chance to see where you’re at, but it also gives you an incentive to do more if you feel you’re falling behind. In that way, the Apple Watch can keep you motivated to stay healthier. 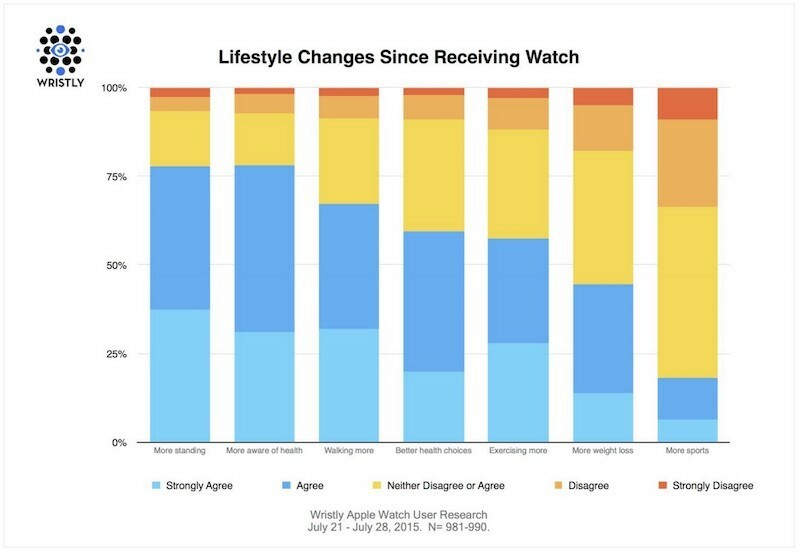 In a recent survey by Wristly, Apple Watch users have been more aware of their health choices during the day. Once you’re aware of your activity (or inactivity) during the day, you can make more conscious decisions to increase your physical activity or ignore it. However if you ignore it, you’ll see the consequences of your actions displayed on your Apple Watch. A large majority of Apple Watch users report doing more standing and being more aware of their health simply by monitoring their activity. If you think you don’t have a use for an Apple Watch, ask yourself if you have a use for better health. The Apple Watch can’t exercise for you, but it can help you track your physical activity so you meet a minimum requirement everyday. That translates into better health everyday, which translates into a healthier lifestyle. By making simple changes during the day, you can create a healthier life for yourself in the long run. While the Apple Watch is more versatile than health tracking, that’s the number one use that everyone can use. Whether you’re a professional athlete or just an ordinary person, you can monitor your activity to see whether you’re meeting healthy goals each day. As long as you’re staying healthy every day, tomorrow will take care of itself, but it all begins with monitoring your behavior, and that’s where the Apple Watch shines. To read more about the impact of the Apple Watch on daily lifestyle choices, click here. 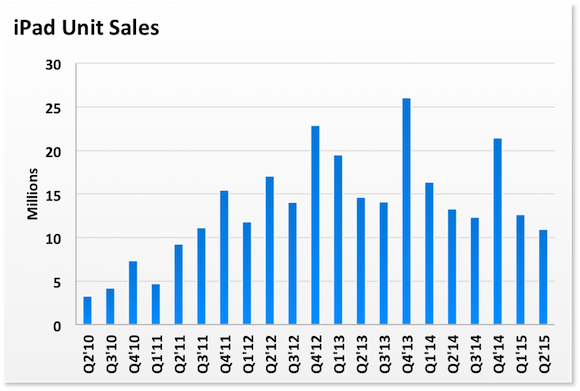 What’s Behind the Drop in iPad Sales? What it is: The iPad defined the tablet market. While initially a hot seller, iPad sales have continued to drop over time. Many people worry that iPad sales are going down because people aren’t finding the iPad useful any more. That’s like saying restaurants are in trouble because once they sell a meal to a customer, nearly 100% of those customers don’t order another meal right away. If you look at the initial sales of the iPad, you can see that sales skyrocketed right away. That’s because the iPad basically eliminated the need for a netbook. Unlike netbooks that were compromises of all sorts from their minuscule size to their underpowered processors and tiny hard disk space, the iPad redefined the tablet market. Sales skyrocketed because so many people wanted an iPad. Now sales are dipping not because people no longer find an iPad useful, but because their original iPad works perfectly well so there’s no need to replace it. In the smartphone market, people are trained to replace their phones every two years once their two-year contract runs out. That creates a constant two-year cycle of smartphone sales. That type of built-in replacement cycle doesn’t exist in the tablet market. If you look at each new iPad model, it essentially gets thinner, lighter, and more powerful. Yet there’s little reason for more power if your current iPad still works. Many people still use the original iPad 1 model that came out in 2010. Most likely those original iPad 1 owners won’t upgrade until at least a five-year cycle occurs. Most likely the iPad is closer to an eight or ten-year cycle than a two-year cycle. Ignoring sales trends, you can see that the iPad recently sold 10 million units, which is about 9 million units more than Microsoft sold of their Surface tablets. While Surface tablet sales are trending up, iPad sales are trending down. Will they ever meet and switch places? Probably not. The basic reason iPad sales are trending down is that most people who want an iPad already have one. Where the market for iPads exists is in the enterprise market, which is why Apple teamed up with IBM to create enterprise iPad apps. In the consumer market, there’s little reason to get a new iPad until later this fall. That’s when Apple will announce faster, more powerful iPad models with split screen multitasking along with a virtual keyboard that doubles up as a trackpad. You’ll be able to get some of these benefits from the latest iPad Air 2 models, but to take full advantage of these latest features, you’ll need a more powerful iPad. That will give people a reason to buy a new iPad. With just minor hardware improvements, there’s no reason why people should continue buying a new iPad every year. With major improvements, people will find a reason to buy a new iPad. Then they’ll hold on to them until another round of major improvements arrives that their older iPads can’t handle. While it would be nice for iPad sales to continue growing every year, that’s not going to happen. The iPad will likely sell in up and down cycles that rely entirely on major improvements to get enough people to upgrade. Apple can still sell iPads to new customers, but their real growth will come from sales of iPads to existing iPad customers. Declining sales of iPads is just a minor warning that incremental improvements are never enough to get people to upgrade. Major improvements are necessary, but Apple can’t introduce major improvements every year, so expect iPad sales to rise and fall for the next few years. Apple is still selling more tablets than other manufacturers, but since they set the standard so high with initial iPad sales, anything less looks like a failure. An iPad is a sturdy tablet that can last longer than two years. Just buy an iPad and use it for as long as you want. Then upgrade when you need newer features. That means you can expect at least five years out of each iPad you buy. How many other computer products can last that long and still be useful? What it is: CurrentC is a new digital payment standard designed to circumvent the credit card companies. You may have heard of Apple Pay and possibly even Google Pay where you can assign a credit card to your smartphone or Apple Watch and pay by simply placing your smartphone or Apple Watch near a payment terminal. What you might not know is that there’s a third digital payment standard called CurrentC, formed by a consortium of merchants including CVS Pharmacy, Walmart, and Best Buy. The biggest difference between CurrentC and Apple Pay is that Apple Pay is designed to work with current credit card companies like VISA and MasterCard. CurrentC, on the other hand, was designed by merchants to circumvent the 2-3% payment merchants must pay for every credit card transaction. By eliminating credit card fees, merchants hoped to keep more money for themselves. That right there poses the biggest obstacle to CurrentC. If CurrentC catches on, VISA and MasterCard immediately lose millions of dollars of transaction fees a day. Think the credit card companies are going to let that happen without a fight? That immediately gives the credit card companies a huge incentive to back Apple Pay and Google Pay as a way to keep themselves relevant in the cashless society of tomorrow. While credit card companies have zero incentive to help CurrentC and massive incentive to support Apple Pay and Google Pay against CurrentC, consumers also have little reason to embrace CurrentC. To make payments, consumers need to use merchant issued cards (instead of bank issued credit cards) or allow merchants direct access to their checking accounts to make payments. This doesn’t serve the consumer; it serves the merchants backing CurrentC. How many consumers will willingly give a merchant access to their checking account or carry around credit cards in addition to merchant-issued cards that are only good at merchants belonging to the CurrentC consortium? Because CurrentC works against current credit card companies and creates additional hassles for the consumer, what are its chances of adoption? Probably very low to nil. When you look at Apple Pay and Google Pay that works with existing credit card companies and makes transactions more secure because it never gives credit card numbers to merchants, you get additional safety with little additional hassle beyond simply assigning a credit card to your Apple Pay or Google Pay account once. Merchants who sank money into CurrentC are simply delusional. With so much resistance from credit card companies and consumers, there’s little chance CurrentC will get very far. On the other hand as people realize how safe and secure Apple Pay and Google Pay are, you can expect those standards to get embraced more widely, especially with the backing of credit card companies that are trying to eliminate today’s insecure credit cards. The future of Apple Pay and Google Pay looks assured with the popularity of iOS and Android. The future of CurrentC looks dead on arrival. Just watch and see how far CurrentC gets before the merchants backing it give up altogether. What it is: AMD (Advanced Micro Devices) is the only other rival to Intel in making x86 processors. Unfortunately as the PC market has dropped, so has AMD’s fortunes. At one time, AMD made processors that were cheaper than Intel’s processors and often faster too. Many PC manufacturers used AMD processors in their budget models and some even put them in their higher end gaming PCs. Back in the good old days, AMD made their money selling processors for less than Intel. Then Intel started making better processors and offering lower cost versions of their latest processors. With both better processors and lower cost processors, Intel effectively eliminated the only two advantages AMD had. That mean PC manufacturers mostly chose Intel processors with only a handful still using AMD processors. To make matters worse, AMD also branched out into graphics cards for PCs. Then the world shifted to mobile computing (smartphones and tablets), so now AMD lost their advantage in both processors and graphics cards in the PC market. Because AMD relied almost entirely on the PC market, their future went down the drain as soon as the PC market began its gradual downward descent with now signs of coming back to life any time soon. At one time, the only way to send e-mail or browse the Internet was through a PC. Nowadays, many people do that though a smartphone or tablet. That means less demand for PCs, which translates into less demand for AMD chips. AMD is basically a goner. They’re trying to branch out into mobile processors but it’s probably too late to save the company. Their graphics cards aren’t bad, but it’s not enough to stop declining revenue. AMD hitched their hopes on a sinking ship (the PC market) and now they’re suffering as a result. So what’s the lesson? First, always assume that good times will never last because they never do. Second, always assume that your entire market will disappear one day. Then figure out what you would do then. In AMD’s case, they assumed that the PC market would be around forever, so the shift to mobile computing caught them unaware just like it caught Microsoft unaware. Microsoft is pinning their hopes on Windows 10, but Windows 10 won’t likely translate into a sudden massive increase of PC sales using AMD chips. Windows 10 may save Microsoft but it won’t save AMD. There have been rumors that Apple or Microsoft would buy AMD, but there’s no reason for either company to buy a dying business. Apple and Microsoft might as well buy a buggy whip or slide ruler company. The world of x86 processors is shrinking and Intel is dominating that market to the detriment of AMD. AMD’s only chance for survival is to shift to the wearable computer market with processors suitable for wearable computers. Yet that’s a small but still growing market and it alone can’t save AMD. AMD’s infrastructure is geared for the PC market so anything short of a miraculous recovery of the PC market won’t be enough to save AMD. AMD is a goner. Hardware is a commodity so it’s only a matter of time before all hardware manufacturers face declining sales and razor thin profit margins. Expect AMD to join the ranks of Blackberry, Nokia, and Palm. AMD is gone. If you own AMD stock, sell now to get what little you can for it. For poor AMD, the world changed too rapidly for them to adopt and now they’re going down the drain with the rest of the PC market. To read about AMD’s latest financial woes, click here.